Nobel laureate economist Friedrich Hayek (1899 – 1992) is one of the most influential thinkers of the 20th century and his work still resonates with economists and scholars around the world today. Two decades after Hayek’s death, his ideas are increasingly relevant in an era where governments grow ever larger and more interventionist. 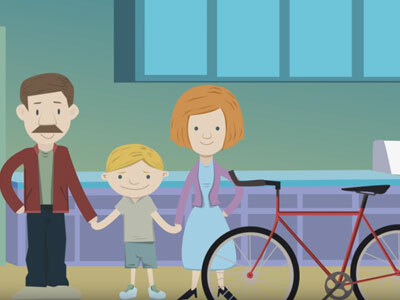 Essential Hayek is a project of the Fraser Institute, comprised of a book, this website, and several videos, that aim to explain Hayek’s ideas in common, every-day language. It is a resource for all who value liberty. Born in Vienna on May 8, 1899, Friedrich A. Hayek moved to England in 1931. While teaching and researching at the London School of Economics, Hayek became one of the world’s most renowned economists even though he was still only in his mid-30s. His fame grew from his research into the causes of what were then called “trade cycles,” what we today call booms and recessions. In the greatly depressed 1930s, of course, such research was especially important. And Hayek wasn’t alone in researching the causes of booms and recessions. Another economist studying the same matter was John Maynard Keynes (pronounced “canes”). Yet Keynes’s theory of booms and recessions was totally different from Hayek’s. Not only were the two accounts of booms and recessions very different from each other at the purely theoretical level, they also differed in the implications they offered for government policies to deal with economic slumps. Keynes’s theory promised that recessions, even deep ones like the Great Depression, can easily be cured by greater government spending. Hayek’s theory, on the other hand, offered no hope that a slumping economy can be cured by any such easy fix. Among professional economists, Hayek’s theory went quickly from being celebrated to being scorned. Keynes’s theory won the day. Whatever the reasons for Keynes’s victory over Hayek, that victory was total. Keynesian economics came to all but completely dominate the economics profession for the next 40 years and to win widespread acceptance among policy-makers. By the early 1940s Hayek was largely forgotten. Hayek’s time in the shadows, however, was brief. In 1944 he published a book that became a surprise best-seller on both sides of the Atlantic: The Road to Serfdom. In this now-classic volume, Hayek warned that attempts to centrally plan an economy, or even to protect citizens from the downsides of economic change, pave a “road to serfdom.” Hayek showed that if government plans or regulates the economy in as much detail and as heavily as many of the intellectuals and politicians of the day were demanding, government must also regiment citizens and strip them of many cherished freedoms. Hayek did not say (as he is often mistakenly accused of saying) that the slightest bit of government regulation inevitably leads to socialism and tyranny. Rather, his point was that the more intent government is on socializing an economy and regulating it in great detail, the greater are the number of individual freedoms that must be crushed in the process. Along with his change from narrow economist to broad social scientist, Hayek moved in 1950 to the University of Chicago. During his 12 years at that institution, he was not a professor in the Department of Economics but, instead, in the Committee for Social Thought. While at Chicago Hayek wrote a second and more extensive book in defence of a free society: The Constitution of Liberty, which was published in 1960. In subsequent decades, two more such “big think” books would flow from Hayek’s pen: the three-volume Law, Legislation, and Liberty (published in the 1970s) and Hayek’s final book, The Fatal Conceit (published in 1988). Law, Legislation, and Liberty shows Hayek at his most bold and pioneering. Volume I brilliantly explains the differences between unplanned orders (such as languages and market economies) and planned organizations (such as business firms and centrally planned economies). Volume II explains why the popular idea of “social justice” is meaningless. Volume III contains Hayek’s most ambitious attempt to describe in detail what the legal and political structure of his ideal society would look like. While still working on volumes II and III of Law, Legislation, and Liberty, Hayek was awarded the 1974 Nobel Prize in Economic Science. Sharing this award with the Swedish economist Gunnar Myrdal, Hayek finally was accorded the professional acclaim that he’d lost since his refusal, four decades earlier, to jump onto and ride the Keynesian bandwagon. Hayek’s close friends tell how this award renewed his vigour to work. He would live for nearly 18 more years and for much of that time he remained as creative and as productive as ever. His last book, The Fatal Conceit, published in 1988, deepens his insights into the potential creative powers of a society governed by evolved rules rather than by the discretion of political officials or of democratic majorities. Chapter by chapter summary of the book. Recent innovations have allowed people to read materials using a wide variety of mediums, including iPads, computers, and even phones. But the original and still most familiar format is paper and ink. Yet the complexity of the coordination required to allow people to read even in this simple format is hard to believe. It illustrates one of Hayek’s most profound insights: the ability of society to organize itself based on the pursuit of individual interests. Imagine yourself standing alone before a gigantic table covered with one billion puzzle pieces. What are the chances that you alone can put these pieces together so that the final result is a coherent visual image—a useful and valuable final result? 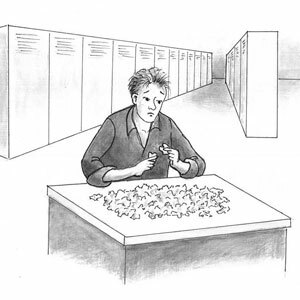 The answer is “virtually zero.” The size and complexity of the puzzle ensures that putting a central planner (or committee of planners) in charge of assembling the puzzle won’t work. In the real-world economy, each owner of private property has incentives to use his or her property in ways that produce the greatest return. 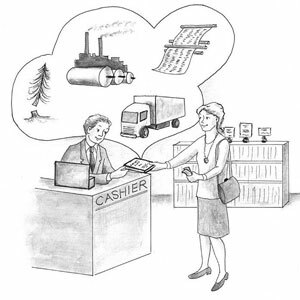 Efficiency is improved and a complex pattern of productive uses of resources emerges spontaneously. And because this unintended, spontaneous outcome emerges from the self-interested actions of owners of private property, each of these owners is made better off. 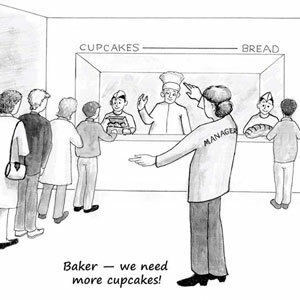 If Betty the baker notices that the price of cupcakes is rising relative to the price of white bread, she will shift some of her effort—along with some of her flour, yeast, and space in her oven—from baking white bread to baking cupcakes. The higher price that she can now fetch for her cupcakes is a signal that she can earn more profits by baking and selling more cupcakes. The rising price of cupcakes reflects an important change in consumer wants. 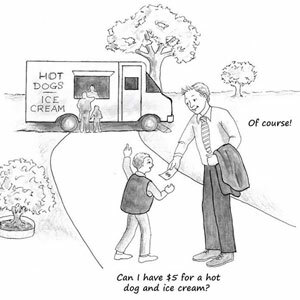 Prices set in market economies “tell” people just how they can best serve others’ interests. 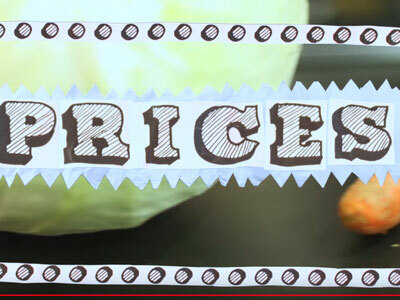 Prices are the single most important sources of information for producers and consumers on what they can expect from others in market economies. A market economy, therefore, expands the ability of each of us to pursue our own goals by harnessing the cooperation of others. How can we be sure that free people will not act selfishly in ways that further their own individual interests at the expense of the general welfare? One part of the answer is that in fact we do expect people to behave in their own self-interest. In a market economy, producers want to become as wealthy as possible, but to do so they must compete against each other for consumers’ patronage. This system rewards success at pleasing consumers, and punishes, with economic losses, the failure to do so. Another part of the answer is the rule of law—a system of rules that are impartial and applied equally to everyone. 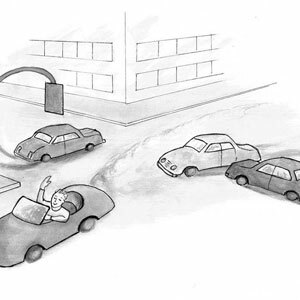 Rules of the highway, for example, hold all drivers impartially to the rules of the road, so every driver forms a reliable set of expectations about how other drivers will act. What’s true of the rule of law on the roads is true of the rule of law more generally. This equality does not guarantee equality of outcomes. 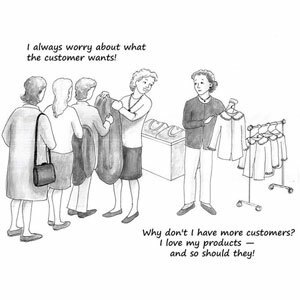 But it does mean that no person’s or group’s interests are given extra weight or are singled out to be discounted. The great bulk of law that governs human interactions was not invented and designed by some great Law Giver. Instead, law evolved. Every day we obey a vast set of rules that are not consciously designed. Consider how parking spaces in shopping malls are allocated on busy shopping days. 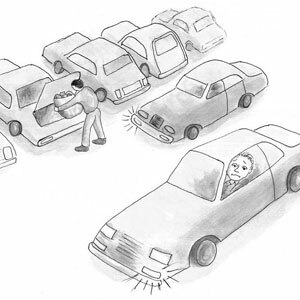 The first person to stop his car near a parking space being abandoned and to put his blinker on in the direction of that space is widely recognized as having established for himself a temporary property right to that space. It is a right that other drivers generally recognize. That is an example of law that is created spontaneously. Law is not always legislated, but it is generally obeyed. Socially beneficial rules of behaviour often emerge and are enforced independently of the state. A government committed to protecting people from any downsides of economic change requires nearly unlimited powers to regulate and tax. As long as people can find some way to change their lives for the better, some fellow citizens are likely to suffer falling incomes as a result. The only way to prevent such declines is near-total government control over the economy. Unfortunately, because economic growth is economic change that requires the temporarily painful shifting of resources and workers from older, unprofitable industries to newer ones, the prevention of all declines in incomes cannot help but also prevent economic growth. So achieving complete protection of all citizens at all times from the risk of falling incomes means not only being ruled by an immensely powerful government with virtually no checks on its discretion, but also the eradication of all prospects of economic growth. Relative prices are the most important “directors” of economic activity. If the pattern of relative prices accurately reflects the many different demands of consumers as well as the costs of the inputs that can be used to satisfy these demands, then entrepreneurs, investors, and consumers will be led by these prices to act in ways that result in all of the economy’s “pieces” being fitted together into a productive whole. The economy at large will work pretty smoothly. 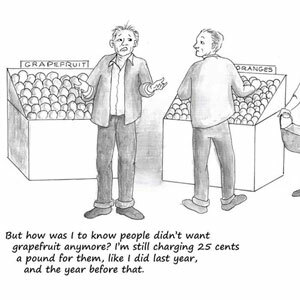 If, for example, consumers come to like oranges more than they had in the past, then the price of oranges will rise relative to the price of grapefruits. Farmers will soon produce more oranges and relatively fewer grapefruits. But if prices become out of whack—when prices in most markets send out misinformation—widespread economic troubles arise. Even a very moderate degree of inflation is dangerous because it ties the hands of those responsible for policy by creating a situation in which, every time a problem arises, a little more inflation seems the only easy way out. 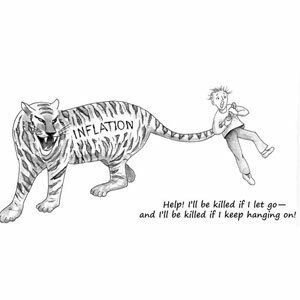 The difficulty of stopping inflation is very much like the difficulty of letting go of a tiger’s tail. The mechanics of doing either task are incredibly easy: just stop printing money (to stop inflation) or relax the muscles in your hand (if you’re holding a tiger by the tail). Yet in light of the anticipated consequences of stopping inflation or of releasing a tiger’s tail, the task in either case is indeed challenging. Every day, each of us participates in two very different kinds of social arrangements: interactions with people who we know and care about; and strangers—the millions of people in the great global web of economic cooperation. One of the greatest challenges to those of us who live in modern society is to be able to function comfortably within both types of arrangements. The challenge lies in the fact that behaviours that are appropriate in one of these arrangements are often inappropriate in the other, and vice-versa. We use informal, non-commercial decision-making procedures and norms in small-group settings, and formal interactions based on mutual consent and governed by an ethic of kept promises in our interactions with countless strangers. The success and sustainability of modern society requires that each of us be guided by our small-group norms when interacting with people we know personally, yet put those norms aside when interacting with strangers. There can be no doubt that ideas have consequences. Ideas about the appropriate role of government determine what government will attempt to do as well as what it must refrain from doing. No society, for example, will follow a policy of free trade if a dominant idea in that society is that trade with foreigners is evil or economically harmful. In contrast, no society will tolerate high tariffs and other protectionist measures if a dominant idea in that society is that restrictions on trade are ethically unacceptable and that free international trade is always economically beneficial. Getting ideas “right”—and spreading those right ideas as widely as possible—is therefore of the highest importance. Widely held mistaken ideas about markets and government will inevitably produce economically damaging policies, while correct ideas about markets and government will foster economically beneficial policies. Get a free digital copy of the book. Choose the version you prefer below. Donald J. Boudreaux is a professor of economics and former economics-department chair at George Mason University and a senior fellow with the Fraser Institute. He is also a senior fellow with the F.A. Hayek Program for Advanced Study in Philosophy, Politics, and Economics at the Mercatus Center at George Mason University and holds the Martha and Nelson Getchell Chair for the Study of Free Market Capitalism at the Mercatus Center. Boudreaux specializes in globalization and trade, law and economics, and antitrust economics. Boudreaux is committed to making economics more accessible to a wider audience, and he has lectured across the United States, Canada, Latin America, and Europe on a wide variety of topics, including antitrust law and international trade. He is the author of the books Hypocrites and Half-Wits: A Daily Dose of Sanity from Cafe Hayek and Globalization. His articles appear in such publications as the Wall Street Journal and US News & World Report as well as numerous scholarly journals. He writes a blog (with Russell Roberts) called Cafe Hayek and a regular column on economics for the Pittsburgh Tribune-Review. He has appeared numerous times on John Stossel’s Fox show to discuss a range of economic issues. Listed below are links to other websites and resources where you can learn more about F.A. Hayek, his theories, his impact on modern economic thought, and access his writings. One of America’s leading economics blogs co-authored by Donald J. Boudreaux, professor of economics at George Mason University, senior fellow with the Fraser Institute and author of Essential Hayek. Filmed at a PBS outlet in San Jose in 1979, these videos capture conversations between F.A. Hayek and a series of notable economists and legal scholars including Armen Alchian, Robert Bork, Leo Rosten, James Buchanan, and Tom Hazlett. Posted on the website of the Foundation for Economic Education, this overview of Hayek was written by Peter Boettke, Professor of Economics and Philosophy at George Mason University. Text of F.A. 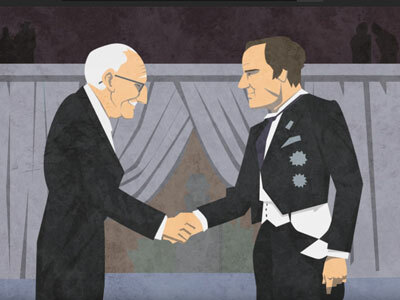 Hayek’s 1974 Nobel Prize lecture. From Libertarianism.org, a resource on the theory and history of liberty. From Liberty Fund’s online Library of Liberty, a collection of seven lectures given between October 7 and November 13 1999 to celebrate the 100th anniversary of the birth of the Austrian economist F.A. Hayek. From Liberty Fund’s online Library of Liberty, The Intellectual Portrait Series: The Life and Thought of Friedrich A. Hayek (audio documentary). From Liberty Fund’s online Library of Liberty, a collection of key extracts by, and essays about F.A. Hayek. From The Best of the Online Library of Liberty, an influential article by Hayek from 1945 in which he demonstrates the part prices play in disseminating widely diffused knowledge about consumer demand and the availability of economic resources in order to make rational economic calculation possible. From The Best of the Online Library of Liberty, this essay by F.A. Hayek offers a concise explanation of the difference between “constructed” orders and “spontaneous” orders. The Concise Encyclopedia of Economics is found on the website of the Library of Economics and Liberty. From the Fall 2002 Quarterly Journal of Austrian Economics, a translation of a Hayek lecture in which he discusses how the re-introduction of the market mechanism for determining the distribution of workers among industries and firms will bring with it a considerable acceleration of the increase of the level of average real wages. From the Mises Institute, a selection from F.A. Hayek’s Individualism and Economic Order, in which he contrasts two types of individualism: one that leads to freedom and spontaneous order, and the other that leads to collectivism and controlled economies. From the Stanford Encyclopedia of Philosophy, David Schmidtz, Kendrick Professor at the University of Arizona, provides an overview of Hayek’s theories and writings. A website with a collection of links to additional articles and books by and about F.A. Hayek. Also includes research resources and audio and video interviews with Hayek. From the Ludwig von Mises Institute, a free PDF version of the Reader’s Digest condensed edition of Hayek’s classic, The Road to Serfdom. 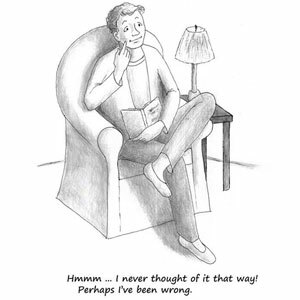 Also available as a free PDF, the Road to Serfdom told in cartoons. This short list of suggestions for further readings is divided into three parts. The first features works by F.A. Hayek himself. The second part contains suggestions for people whose only introduction to Hayek is this book. The third part offers more “advanced” suggestions for readers who seek a greater depth of knowledge of Hayek’s scholarship. All works are listed along with their original dates of publication, although many of them have since been republished and often updated. 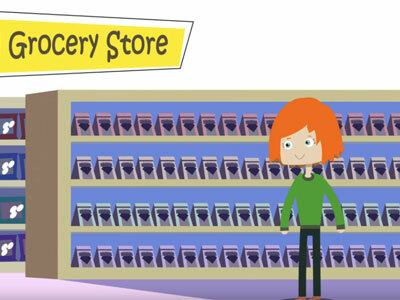 One of Hayek's best known ideas and perhaps his most profound insight is the role of prices in conveying information. This topic is explored in more detail in Chapter 2. Hayek is perhaps best known for his work on economic booms and busts, for which he was awarded a Nobel Prize in Economics in 1974. Hayek points out that a common mistaken conclusion about the larger economy is that economic downturns—recessions—are caused by too little overall demand. A follow-up mistaken conclusion is that the appropriate cure for recessions is a set of government policies that increase demand. Chapter 7 provides more details. 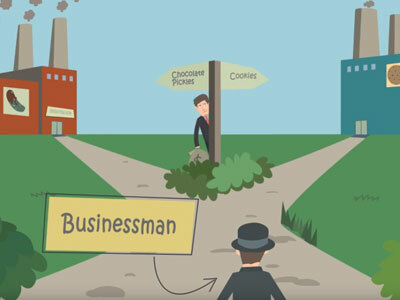 This video from Learn Liberty shows how prices help coordinate the billions of choices that result in a productive and dynamic economy. Hayek’s insights on how prices provide us with information is explained in Chapter 2. According to one of Hayek’s key theories, a critical difference exists between legislation and law. The great bulk of law that governs human interactions was not invented and designed by some great Law Giver. Instead, law emerged without centralized design. Law evolved. Learn more in Chapter 5. 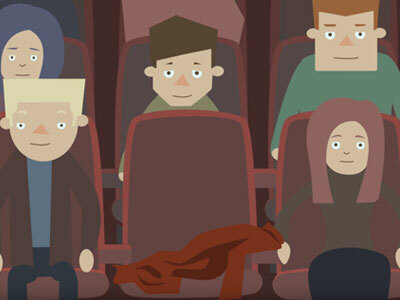 One of Hayek's more complex theories is the concept of how living in a modern society involves two sets of very different interactions: those that occur among our family and friends, and those that occur in the modern world. Chapter 9 has the details. This video provides an overview of Hayek’s life, his accomplishments, and the events that influenced his thinking. Made possible by a generous donation from the Lotte and John Hecht Memorial Foundation. Copyright ©2019 The Fraser Institute.